CheMatech offers a bionconjugation service. In order to get images and information of the best quality, it is primordial to chose the most adapted chelate for a given metal to avoid the release of the radionuclide in-vivo. Our wide range of chelators allows the specific bionconjugation onto cysteins, lysines and by “click-chemistry”. We also offer the possiblity to add a fluorescent probe in order to perform optical imaging. These bimodal systems are of great interest as diagnostic tools or for surgery assistance. Both the chelator and the fluorescent probe can be adapted in order to obtain a bimodal system adapted to your needs. 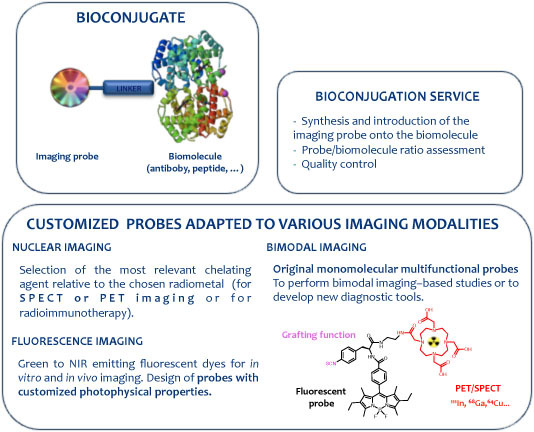 Moreau et al., Bioconjugate Chemistry, 2012, 1181-1188.